Firstly, you don't have to be a wine expert to host a wine tasting party. These wine tasting party ideas have been designed to make wine tasting accessible and enjoyable for everyone, regardless of how much you or your guests know about wine. So whether the wine tasting is the entire theme of your party or just a small part added on to enhance a birthday / dinner party the main thing to remember is: make it fun. You want your guests to enjoy some great tasting wines and maybe learn something new along the way. The last thing you want is for people to feel intimidated or that they can't contribute. So the wine tasting party ideas below are designed with that in mind. My advice is not to take a wine tasting party too seriously and do everything you can to put your guests at ease. Encourage people to express what they like or don't like about each wine, rather than getting bogged down on what's the 'right' or 'wrong' answer-because with something as personal as taste, there isn't one. First, you need to think about what format your party will take. You can apply most of the wine tasting party ideas below to gatherings of all sizes but you do need to decide how best to structure the evening. If numbers are small, say 6 -12 people, I think it's preferable to seat everyone around a table and structure it like a dinner party. This way, not only is there plenty of space for glasses and bottles, but it creates an intimate environment for everyone to discuss and share. Plus you can control the pace of the wine tasting more easily, moving onto the next one when everybody is ready. So let the size of your table dictate the best number of guests. Alternatively, for a more relaxed vibe you could arrange everyone on soft chairs around a smaller coffee table in the middle of your sitting room. 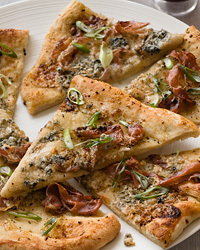 You can apply these wine tasting party ideas to either set up. For larger groups, think of it as a 'cocktail party' but set up a number of small tables around the perimeter of the room to act as 'wine stations'. Number each wine station so they flow around the room in chronological order (so that guests taste each wine in the correct order—more on this in the 'Things To Remember' section of these wine tasting party ideas). This way people can work their way around the room in smaller groups at their own pace. 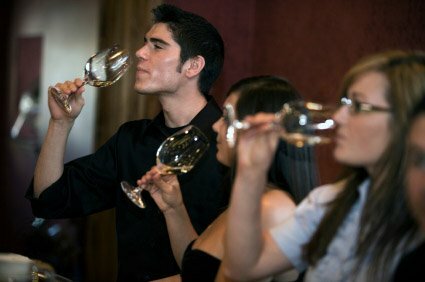 If the wine tasting is the main focus of your party and you genuinely want guests to discover and discuss different flavors of wine (and perhaps try to identify them blind) then don't serve any alcohol or soft drinks before the wine tasting begins. You want everyone to start with a clean palate so as not to affect the taste of the wines. So invite everyone to come at a certain time and ask them to be prompt. Then just serve sparkling water (and appetizers if you really feel you need to) for the first half an hour as guests arrive then go straight into the wine tasting. Matt's Tip: Don't include any strong flavors such as chilli or olives in your appetizers, as this will also affect the taste of the wine. And definitely no cheese! Despite the common pairing of wine and cheese, this is best avoided at a wine tasting. 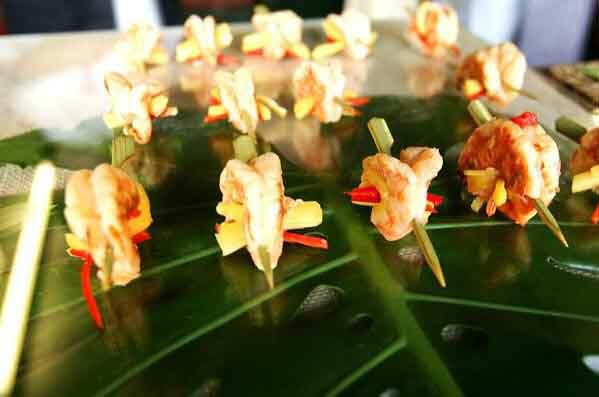 More on this in the 'Things to Remember' section of these wine tasting party ideas below. 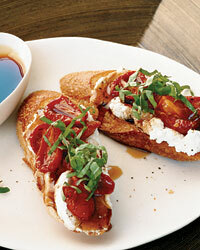 After the wine tasting you can them move onto more appetizers, dinner, or dessert. For more informal wine tasting party ideas, where your objective is for guests to sample some great wines without trying to identify flavors or the type of grape then you can pair each wine with a different complimentary appetizer. Alternatively, for a seated dinner you could integrate some of these wine tasting party ideas with the meal by tasting a different wine with each course. This is quite a nice way to really savor each wine and you can have a lot of fun designing a menu where each dish compliments a different wine. Some of the most successful and enjoyable wine tastings I've been to (and have organised for my clients) have been the ones where there was a theme. A wine tasting is such a broad concept and it can suffer from having slightly stuffy—even pretentious—connotations. So applying a theme to your wine tasting party ideas can help communicate more clearly to your guests the type of party you have in mind. For example, just advertising your party as a wine tasting might make it sound a bit dry and serious. But bill it as 'an exploration of the wines and foods of Tuscany' can add an extra layer of excitement and expectation to capture your guest's imagination. A blind tasting works best when you want to compare different varieties of grape such as Chardonnay, Pinot Grigio, Shiraz, and Pinot Noir. It can add a bit of fun to these wine tasting party ideas because it gets your guests more involved. This can work well as an ice breaker or for parties with large numbers. 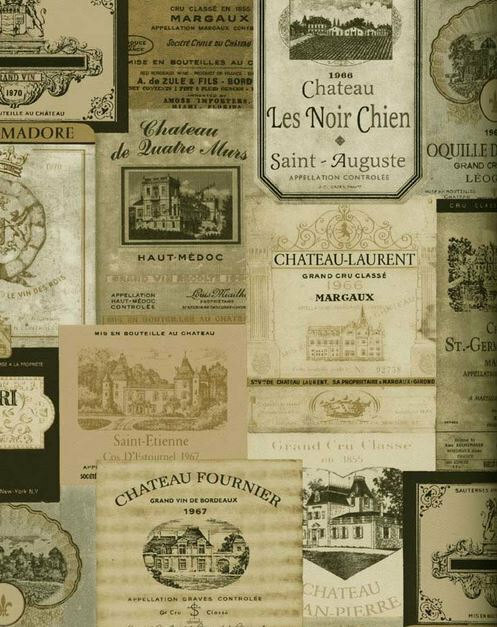 The wine labels are hidden and guests try to identify the country, grape, and perhaps the price point from the appearance, aroma, and taste of the wine. Bear in mind if your guests aren't already familiar with different wines, a blind tasting can be a bit of a wild stab in the dark. 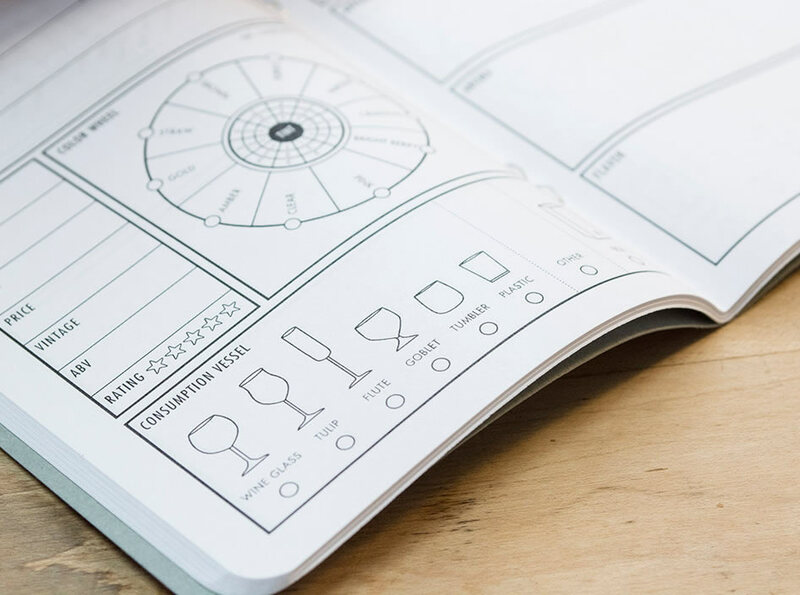 Therefore, I think it's a good idea to print off some short descriptions explaining the qualities and flavors associated with the different wines—to help guide people in the right direction. For example, if you're tasting three white wines provide short notes about four of five different white wines (always provide more descriptions than wines so some act as 'red herrings' and they can't just work out which is which by process of elimination). So if one of your wines is a Viognier the notes might explain that it is a dry wine that typically has a deep golden color with a powerful, rich aroma like apricots and orange blossoms and a distinctive tropical fruit flavor of apricot, peach or pineapple and a creamy mouth feel. Your guests can then refer to their notes when tasting each wine to see if they can identify which wine is which by recognising its flavor profile. As they taste and discuss each wine, have your guests make a note of which they think it is, the country of origin, the price point, and which is their favorite. At the end reveal all the answers and see who has correctly identified the most wines. It's often interesting to see whether people preferred the old world wines or the new world ones, or the cheaper ones to the more expensive. Sometimes it turns out to be the opposite of what's expected—that's the beauty of a blind tasting. 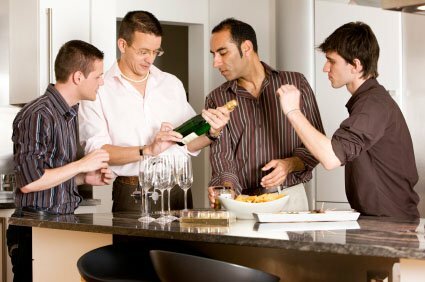 You can make these wine tasting party ideas as difficult or easy as you like, for instance you might want to tell everyone the country of origin of each wine as a starting clue, or you could make things more competitive by splitting people into teams (men v women usually brings out everyone's competitive streak!). 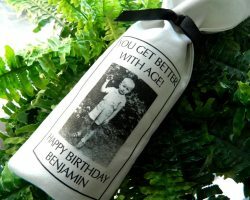 Check out suppler 1 where you can pick up some tasteful burlap wine bags with numbers printed on them to hide the wine labels. 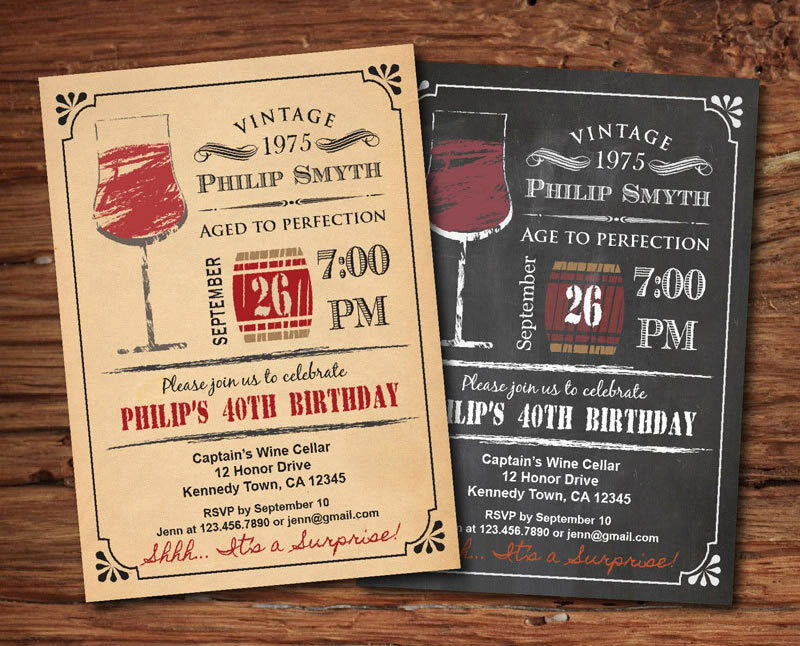 There are even some fun designs and ones that can be personalized with a photo if the wine tasting party is a birthday, such as these ones below (more designs available from supplier 1). Non-blind wine tastings work well for more relaxed, informal tastings where the objective is just to taste and enjoy the wines, or for when combining with a seated dinner or buffet. As with a blind tasting you could explore different grapes varieties, or you could compare the same type of grape from different countries or vintages to see how different they can be. The advantage of a non-blind tasting is that knowing more about the wine, such as the country, flavor profile, and a little history about the winery, can often add to your guest's enjoyment of the wine. For example, being told that a Brunello di Montalcino from Tuscany has a taste of blackberries, currant and spice with hints of plum and raspberry paints quite an evocative picture of a Tuscan vineyard in your mind. As you taste it you can then focus your tastebuds on those particular flavors. One of my favorite wine tasting party ideas is a variation on a blind tasting. Make half the wines affordable everyday wines and the other half more expensive fine wines. Have everyone taste the wines blind and rank them in order of price from low to high, along with their reasons and which they preferred. You might be surprised to find expensive wines ranking low and vice versa. 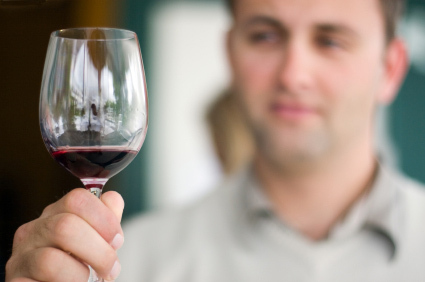 It's always best to tailor these wine tasting party ideas to your audience. So if your guests aren't the type to spend large amounts when buying a bottle of wine you could make that the theme of your tasting. For example, 'The best wines under $10 / $20' (or whatever price point is appropriate). You could always throw in one more expensive wine without telling them, taste them all blind, and see if its stands out. For a fun alternative wine tasting party—that would be particularly good for a bridal shower or bachelorette party—you can pair it with chocolate! Now, you can't pair just any old wine with chocolate, as most chocolate will ruin the flavor of the wine. You have to match intense, fuity wines with high cocoa content quality chocolate. Fortunately, the master chocolatiers from premium Swiss chocolate brand Lindt have done all the hard work for you by teaming up with the winemakers of J.Lohr Vineyards to find the perfect wine pairings for their Lindt Excellence range of chocolate; which includes flavors such as 'Intense Orange', 'A Touch of Sea Salt', 'Chilli', 'Pineapple', and '70% Cocoa'. 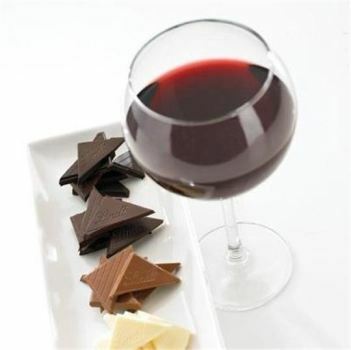 Read my seperate page on Wine and Chocolate Tasting for more information on these pairings. 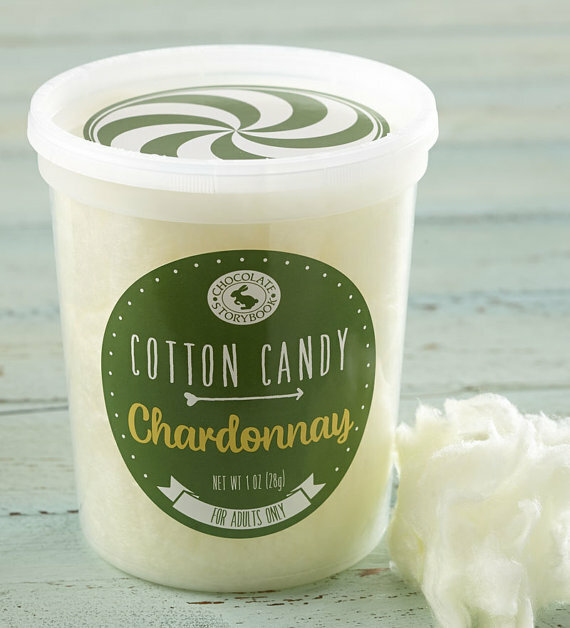 If you don't want to throw an entire wine and chocolate tasting party, you could always add one or two of these onto the end of your regular wine tasting to end on a sweet note. Another option is to make local wines the theme of your wine tasting party ideas. 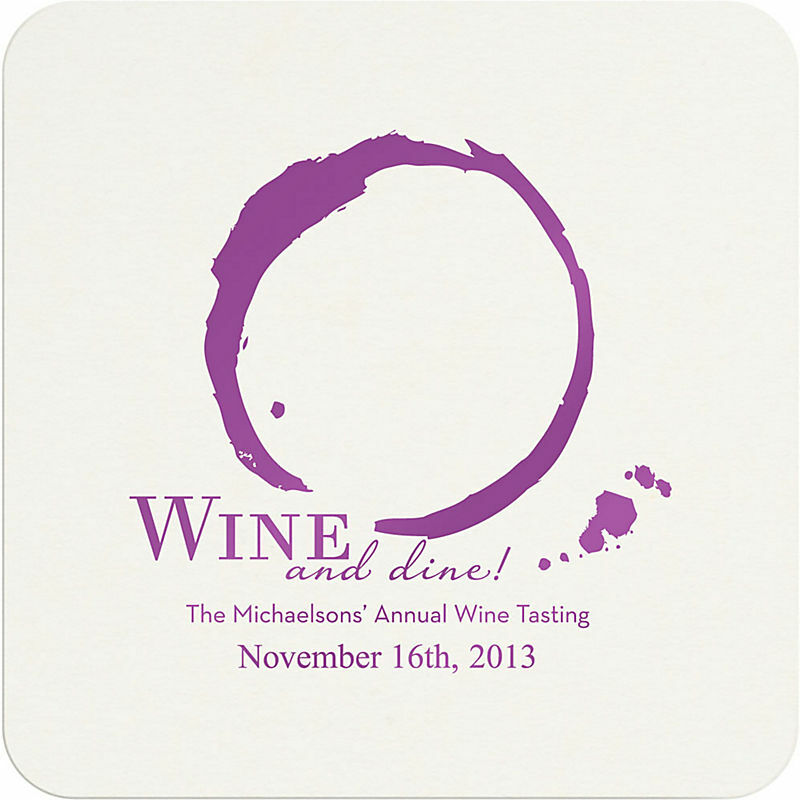 This is usually a great opportunity to sample smaller, perhaps less commercial wines from local winemakers. You can then complement the wines with locally sourced food from farmers markets. Matt's Tip: There's also no reason why you can't incorporate some of the above wine tasting party ideas into another party theme altogether. You don't necessarily have to make the wine tasting the actual theme of the night. 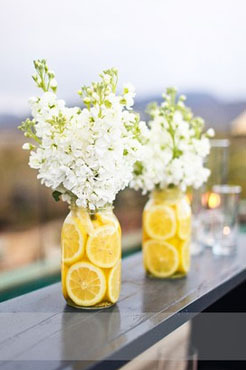 For example, you might use my Secret Garden party ideas as your overall theme but then include a mini wine tasting to punctuate the meal as an extra bit of entertainment. Check out my list of Adult Party Themes for other ideas you could combine with these wine tasting party ideas. 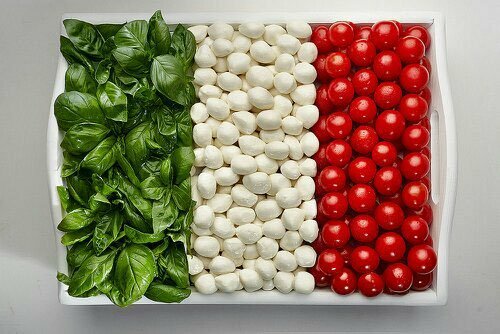 Focusing on particular countries or regions is a great way to add more themed elements to your wine tasting party ideas. For example, you might want to choose each wine from a different country then you could serve a themed appetizer (or dish, if it's a seated dinner) to match each wine. 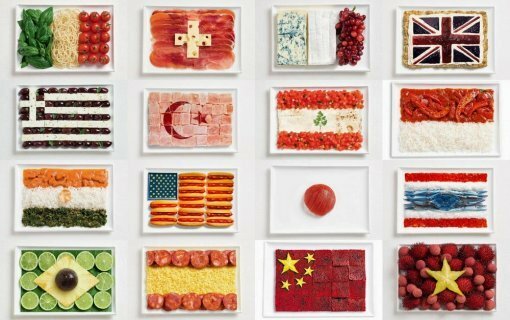 If you type 'Flags made of food' into Google Images, you'll find some great inspiration for how you can make trays of appetizers to represent each country;s flag, such as the ones below. Admittedly, most of the ones you'll find on Google won't be made up of suitable appetizer foods, but you'll just need to give some thought. to different colored foods. The Italian, French, and Spanish flags below are a good starting point. South African wines often have big, bold, fruity flavors and exploring these wines would give you a great to excuse to serve your guests some exotic meats and fish such as springbok / kudu (antelopes), venison, ostrich (right), tilapia, nile perch, marlin, kingklip, even crocodile! Some of these might sound extreme if you're not used to them but they're all quite delicious and parties are all about trying something new and different so why not experiment? It'll certainly give your guest's something to talk about. 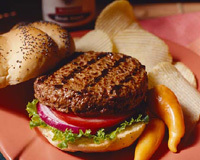 If you're not feeling brave enough to go all the way there are lots of online exotic meat suppliers who offer most meats in burger form, such as African lion meat burgers, ostrich burgers, and crocodile burgers. 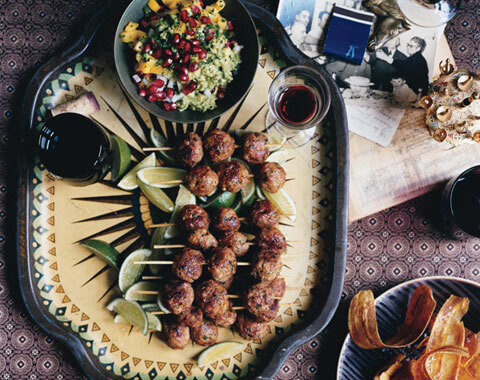 So you could serve up some bite sized exotic mini burgers to go with these wine tasting party ideas. 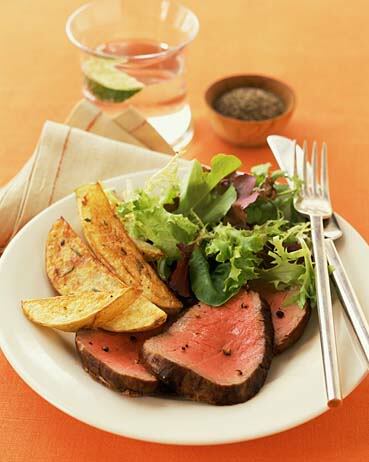 Similarly, if you explore Aussie wines you could also work some exotic meats into these wine tasting party ideas. How about kangaroo (below left) or alligator burgers? Or emu (below right) / camel steak? If you're not feeling that adventurous, you could always play it safe with a traditional BBQ. Tapas is the perfect accompaniment to Spanish wines and lends itself well to a party format as everything is pretty much bite sized so can be eaten standing up. 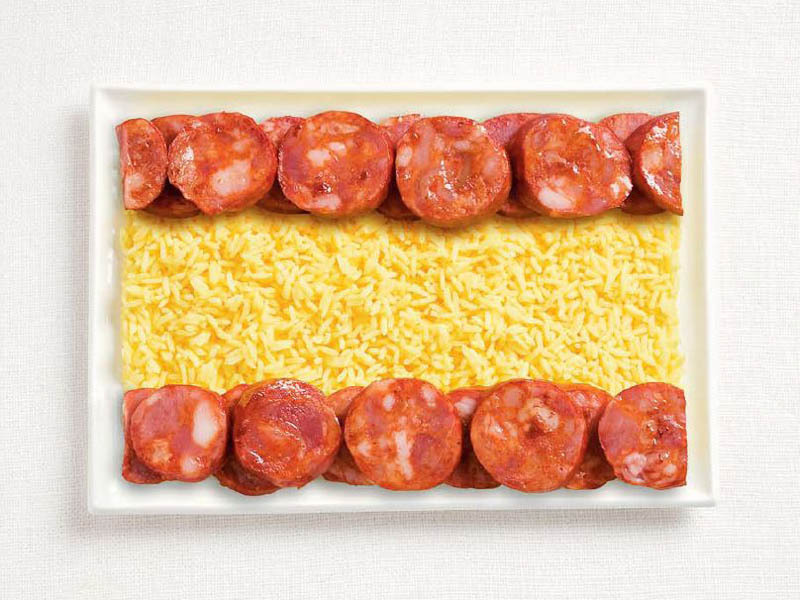 Common Spanish tapas are olives, anchovies, baby squid, chorizo, empanadas (savory turnovers), scallops, and tortilla (a type of omelete). 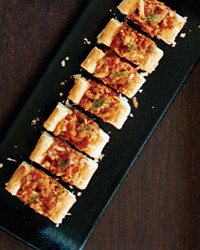 Here are some other tapas recipes (from Food & Wine) to go with these wine tasting party ideas, including Chorizo-Filled Dates Wrapped in Bacon (below left), Open-Faced Crab Empanadas (below center), and Flatbreads with Shrimp and Romesco Sauce (below right). Antipasti is a great accompaniment to Italian wines and, like tapas, lends itself to larger parties because it can be eaten like hors d'oeuvres. 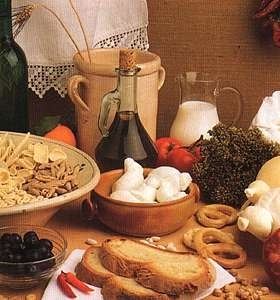 Traditional antipasto includes meats such as ham or salami, olives, artichoke hearts, and cheeses such as mozzarella or provolone. 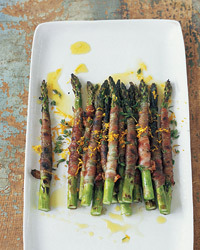 Here are some other antipasti recipes (from Food & Wine) to go with these wine tasting party ideas, including Pancetta-Wrapped Asparagus with Citronette (below left), Honey-Tomato Bruschetta with Ricotta (below center), and Fig and Prosciutto Flatbreads (below right). 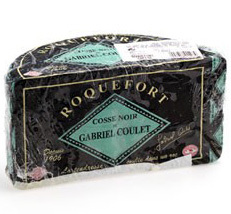 If you going old school with the wines then you might want to marry them with some gourmet French cheeses. A word of warning though, if you're taking the wine tasting seriously you're best avoiding any cheese at least until after you've tried each of the wines. This is because the cheese affects how you taste of the wine. 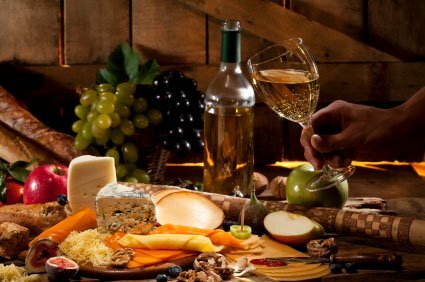 Scroll down these wine tasting party ideas to the section called 'Things to Remember' for further more information on this. 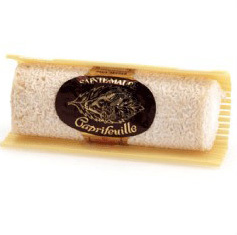 I'd recommend you get your cheese from a specialist retailer—don't just buy French cheeses from your nearest supermarket as these will be mass produced and nothing special. Cheeses are similar to wines in that you're generally best off seeking out smaller, specialist manufacturers—the difference in taste between these and supermarket brands is worlds apart. There's really no point going to all the bother of choosing great French wines if you're not going to get some high quality cheeses to go with them. If you don't have a specialist cheese shop near you just order them online—you often get a much broader selection anyway. There are some great wines from countries such as Chile and Argentina which would give you an opportunity to add some South American flavour to your party food. Here are some Latin American recipes (from Epicurious) for inspiration, such as this Jerk Beef on Plantain Chips (below left), and these Chipotle Meatballs (below right). Choose 4 - 8 different wines to taste. 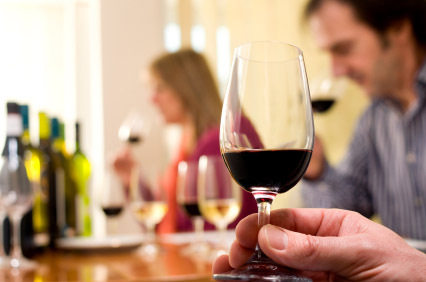 The recommended amount of each wine for a tasting is 2 ounces per person. So, 1 bottle of each wine will serve up to 12 people. I think 6 wines is best (perhaps 3 white and 3 red) as that's about enough to keep people's attention—anymore and it can become hard to distinguish them all from one another. 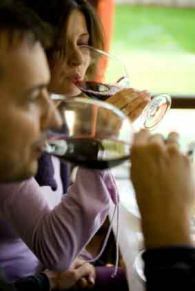 Wines glasses should be clear so that guests can see the color clearly (especially if it's a blind tasting). Make sure the glasses have a stem (so the wine isn't warmed by cupping the glass in the hand) and a deep enough bowl to be able to swirl the wine around (see How to Taste Wine below for more info). Pitchers of water. Unless you have enough glasses to provide everyone with a fresh one for each wine, just provide pitchers of water to rinse glasses (and people's palates) after each wine. Dump buckets. You'll need to provide dump buckets for people to pour any left-over wine away before moving onto the next one. These can also double up as buckets to dump the water into when rinsing glasses in between wines. 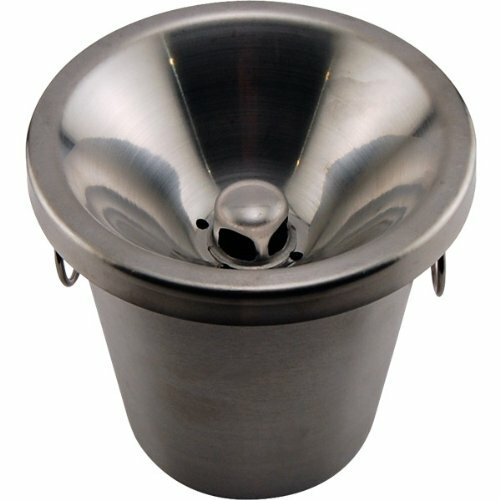 Alternatively, you can pick up proper wine spittoons like the one below from supplier 3. Ice Buckets / Decanters / Corkcicle. Decant your red wines a few hours before. For white wines most people chill them in ice buckets, but this often chills them too much and you end up masking a lot of the flavors. To keep wines at the optimum temperature, use a Corkcicle. It's a handy little gadget that you insert into an open bottle to cool the wine from the inside out. For more info and a video demonstration, see the 'Temperature' section of Things To Remember below. 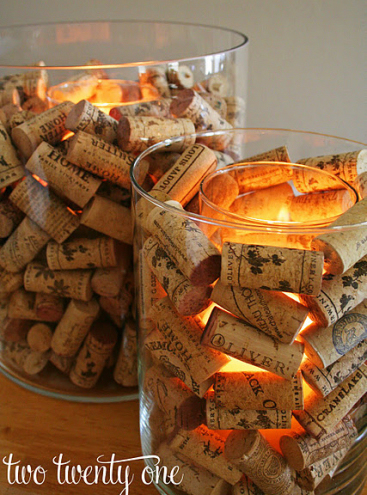 Cork Screws. Always have a back up cork screw. Guaranteed it will break when you need it most. Palate cleanser. If you're taking the wine tasting seriously, provide plain crackers (nothing flavoured) or pieces of bread (nothing grainy / salty) such as baguettes which will help cleanse the palate in between each wine. Glass identifiers. 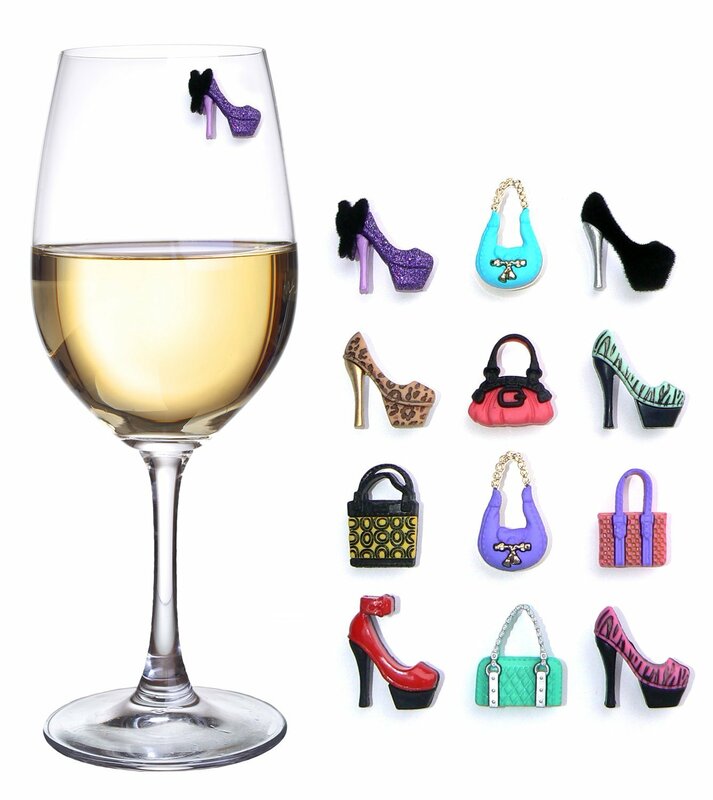 If it's a light hearted wine tasting party, such as a bridal shower or bachelorette party, there are lots of different novelty wine charms you can attach to the wine glasses to help guests identify which glass belongs to whom, such as these below from supplier 3. 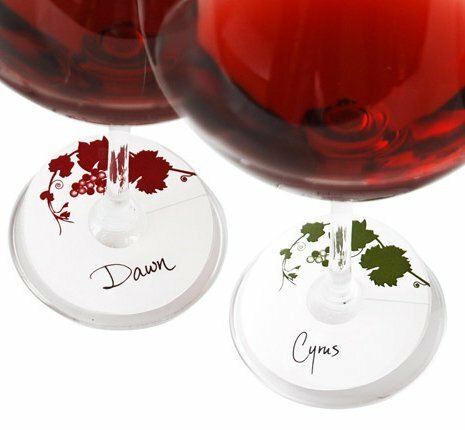 Alternatively, if you prefer something more simple, use these wine glass tags (below left) or these non-permanent wine glass markers (below right) both from supplier 3. Tasting menus. For non-blind tastings its quite nice to provide a simple tasting menu which introduces each wine with some background information such as the country of origin, the flavor profile, and perhaps some background on the winemaker. Flavor profiles. For blind tastings provide some notes explaining the flavor profile for different grapes to help steer guests in the right direction (see Blind Tastings in the themes section above for more info). Bags. 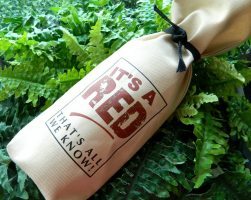 Finally, for blind tastings don't forget to provide some bags to wrap each bottle in to hide the label. See supplier 1 for these. Score Cards. 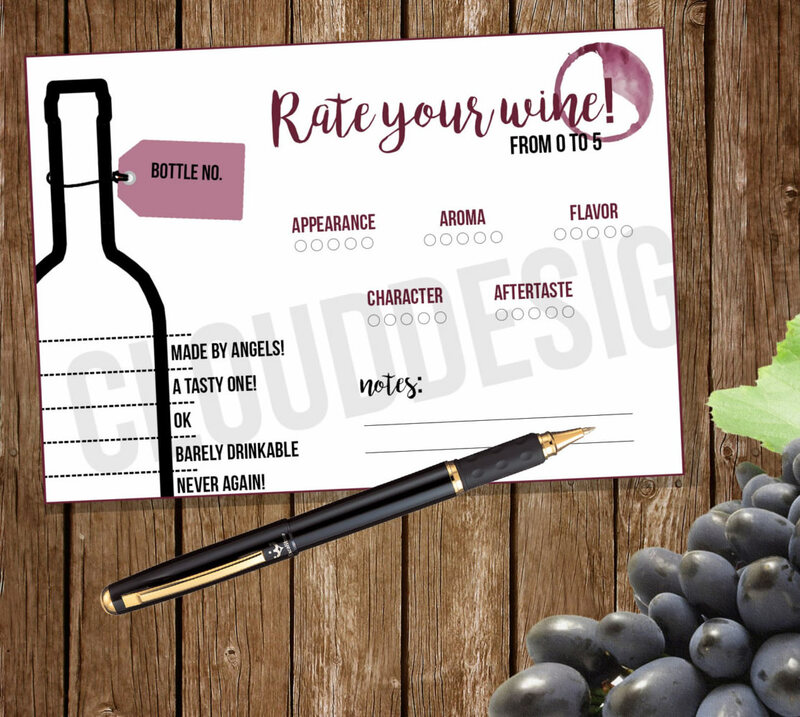 For blind and non-blind tastings, make some homemade score cards to rate and make notes on each wine. Alternatively, you can buy nicely designed ones, such as the ones below, from supplier 1 which you can download and print at home. 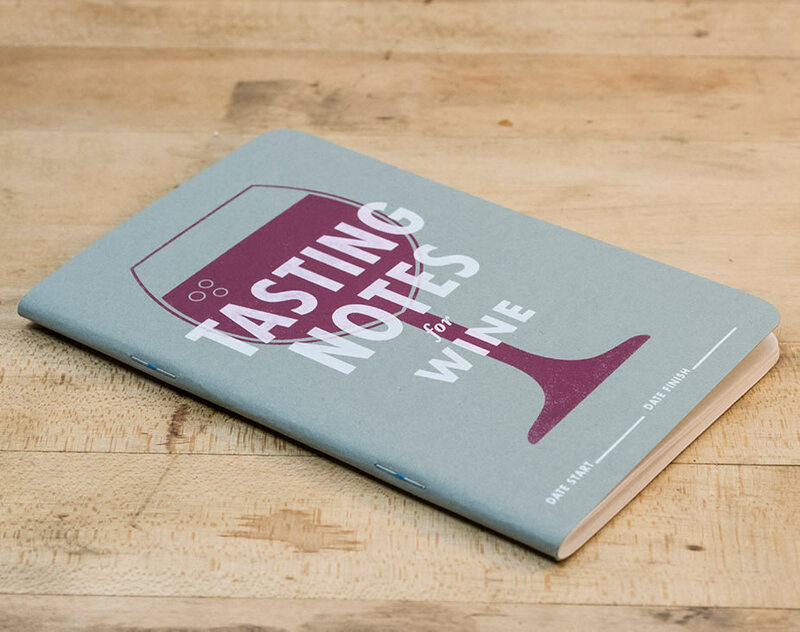 Alternatively, if it's a special occaision, you could provide guests with these wine tasting note books, also from supplier 1. The order in which you taste the wines is important. Start with dry, through to sweet for the whites then move onto light through to full bodied with red, younger to older. If you holding a blind tasting for larger numbers be sure to number each bottle so guests know to taste them in chronological order. Generally most people serve their white wines too cold and their red wines too warm. This really affects the taste of the wine. 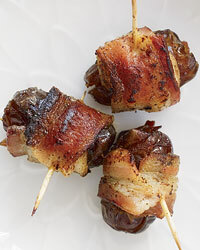 Too cold and you wont be able to appreciate the subtleties of flavor, too warm and all you'll just taste the alcohol. The temperature of most refrigerators is too cold for most white wines, so remember to take them out of the fridge about 20 minutes before you want to serve them. The exception is sparkling wines which are best served really cold so can be chilled over-night and served straight from the fridge. Similarly, red wines are commonly served at 'room temperature' but this phrases was coined in Victorian times when rooms were a fair bit colder. So you really want to serve red wines below modern 'room temperature'. As a very general rule of thumb, when you're taking the white wines out of the fridge, pop the red ones in for about 15-20 mins. The biggest problem is keeping the wines at the right temperature during your wine tasting. 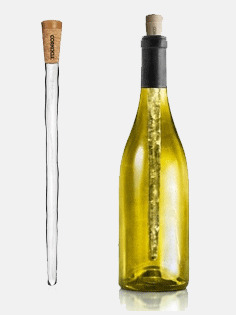 There's a nifty little gadget called the Corkcicle (right) which is a thermal gel shaped like an icicle that you keep in the freezer, then insert into an open bottle of wine so that it cools the wine from the inside out. This is great for keeping both red and white wines at optimal temperature, so you can do away with ice buckets altogether. Check out the video below for a demonstration. or here for how to purchse Corkcicle. Decant your red wines. If it's an old wine you want to decant it to remove any sediment then serve immediately. 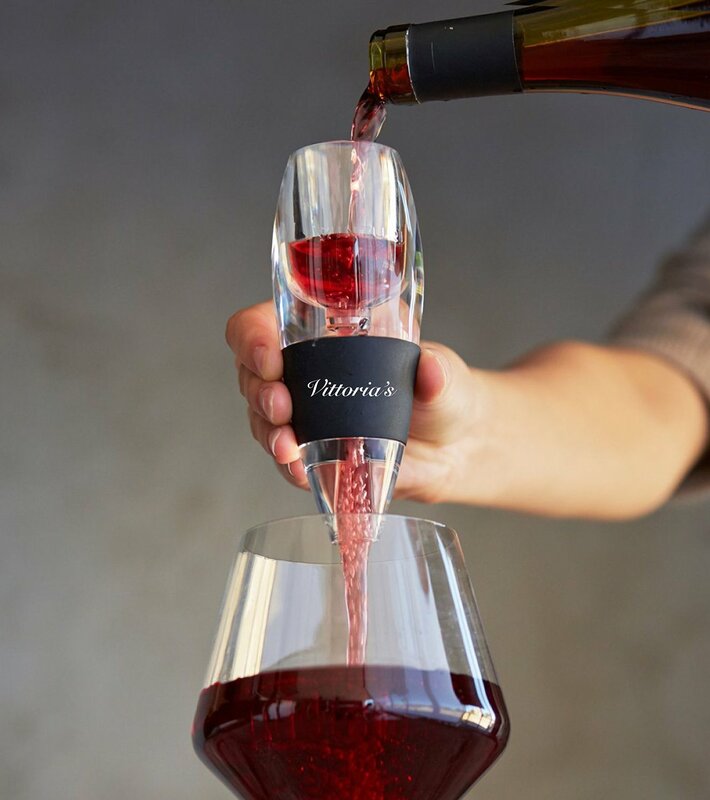 If it's a young wine the purpose of decanting is to aerate the wine as the oxygen releases their aromas. Most younger wines nowadays don't really need to be aerated for long so I would suggest about 30 mins should be plenty. Alternatively, you can pick up a wine aerator like the one below for about $10-$15 from supplier 3. Remind your guests to hold their glass by the stem as cupping the bowl in their hands will change the temperature. And always rinse the glass out before moving onto the next wine. Remind your guests to drink water and taste some bread or plain crackers in between each wine to cleanse the palate. Despite wine and cheese being a common pairing, cheese is actually a terrible thing to eat when trying to taste wine. Infact there's an old French saying that says 'Buy on bread, sell on cheese' meaning if you are buying wine taste it with bread in order to get the true flavor, if you are selling it offer cheese as this can help mask the flavors (if it's a bad wine!). If you think about it, it's actually common sense. To taste all the delicate flavors in a wine you use your taste buds. But eating cheese coats the taste buds in a layer of fat (which has a habit of staying on the tongue for some time). So how are your taste buds going to experience the wine? Therefore, if you're serving cheeses, leave them until after you've tasted all the wines. Matt's Tip: If you have eaten some cheese before your wine, have a slice of apple which will help to open up the taste buds again. Start by holding the glass (preferably over a white table cloth) tilted away from you to examine the color. 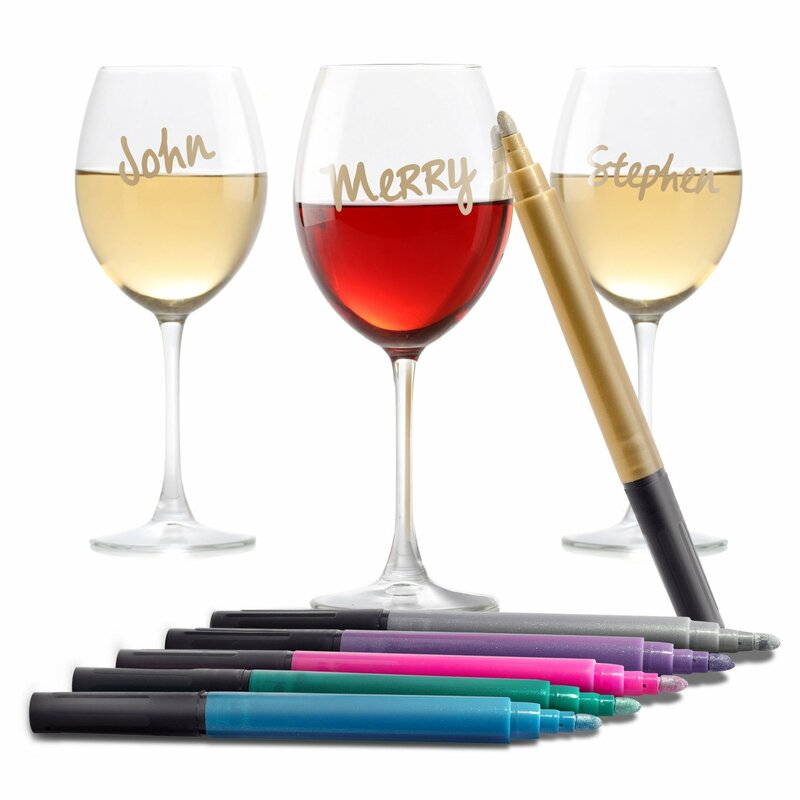 Try to pin point the shade of white or red, for example is the white wine a straw yellow, yellow-green, or gold color? 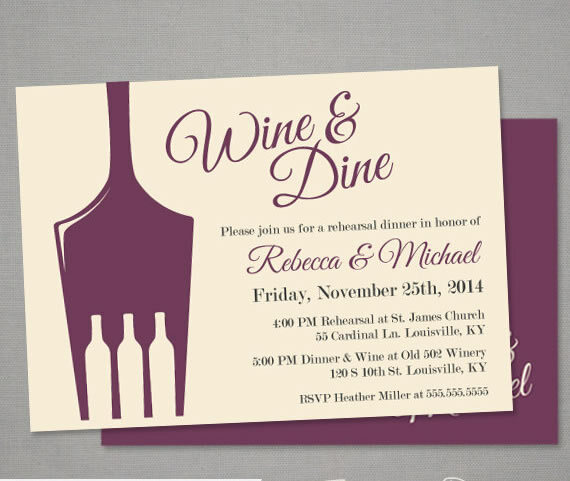 Or is the red wine a ruby red, red-brown, or purple-ish color? Then study the opacity. Is it dark or watery? Clear or cloudy? First, swirl the wine in the glass for a good 5-10 seconds as this will release the aromas. Put your nose to the glass and inhale deeply to see what the smells remind you of? Can you identify any fruits, flowers, herbs, spices, or even more unusual flavors such as chocolate or oak? Next, take a sip but don't swallow the wine. 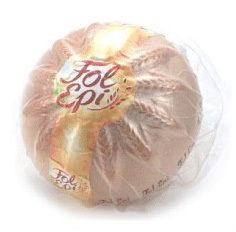 Instead let it swirl around gently in your mouth. Think about things like whether it's dry or sweet? Light or heavy? Thick or thin? Creamy or crisp? Then move onto trying to identify the flavor profile, in the same way as when you smelt it, ie can you detect fruits, spices, or a woody taste? Swallow the wine and think about what sort of after-taste (or 'finish') is has. Do the flavors linger or disappear quickly? Would you describe it as light-bodied (ie watery), medium (milky), or full bodied (creamy)? 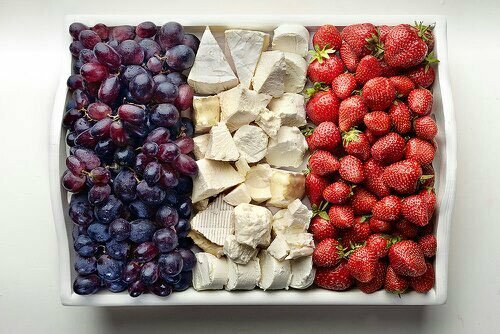 First, decide what theme you're going to apply to these wine tasting party ideas ie all Australian wines or a mixture of different countries etc. 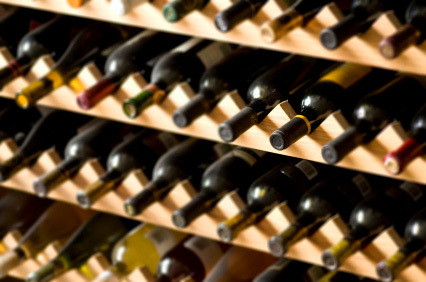 Most supermarket brands are mass produced, commercial wines which are usually chosen because they are 'safe' enough to appeal to the mass market (notice the abundance of Chardonnay and Merlot?). While they will taste fine, they're usually not particularly special or unusual. If you're having a wine tasting you really want some interesting wines, not a bog-standard E&J Gallo wine that you could have any night of the week. If your guests are all local and you select everyday wines from the supermarket, there's a chance you might choose wines that they are already familiar with. Which takes some of the novelty out of a wine tasting. Often supermarket wines aren't stored in the best conditions, ie standing up on shelves (whereas they should be lying down to keep the cork moist), or at the wrong temperature / in direct sunlight. If you don't have a good wine merchant near you (or even if you do) there are some great on-line wine suppliers who always run different promotions, clearance sales, and reduced price deals on mixed cases. Often they offer better deals that you could get by going into a local wine merchant. 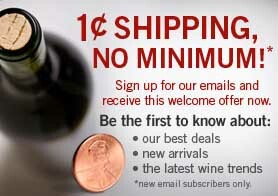 Wine.com in particular has a great deal whereby if you sign up for their email newsletter you get a promo code for 1 cent shipping on your first order . Some people, especially when it comes to blind wine tastings, ask their guests to bring a bottle of their favorite wine to the tasting. I would advise against this because you have no control over what people bring so you may well end up with 3 Chardonnays and 3 Merlots. Viognier is my favourite white wine. It's fast growing in popularity and makes a great alternative to Chardonnay. The South African and Australian varieties in particular have a big bold flavor and and a dinstinctive taste of apricot, peach and spice. Pouilly Fumé is from the Loire Valley, France and is made from Sauvignon Blanc. It has an unusual flavor for a dry white, with a strong smokey musk flavor. Montepulciano d'abruzzo is an Italian red wine made from the Montepulciano grape in the Abruzzo region and tastes of cherry, blackberry, flowers, and herbs. Note there are lots of cheap bottles of Montepulciano d'Abbruzzo around so I would suggest investing in a slightly more expensive one for your wine tasting. Pinotage is South Africa's signature red variety of red, which was bred as a cross between Pinot Noir and Cinsaut. The most amazing Pinotage I've ever had (and highly recomend) is by Diemersfontein and has such a unique flavor that it actually taste of chocolate and coffee (with a hint of mint and baked plums, they say). It really is an exceptional and unusual wine. Sauternes is a sweet French wine from Bordeaux, France made from Sémillon, Sauvignon and Muscadelle grapes. It tastes of apricot, honey, and peach and makes a great dessert wine. 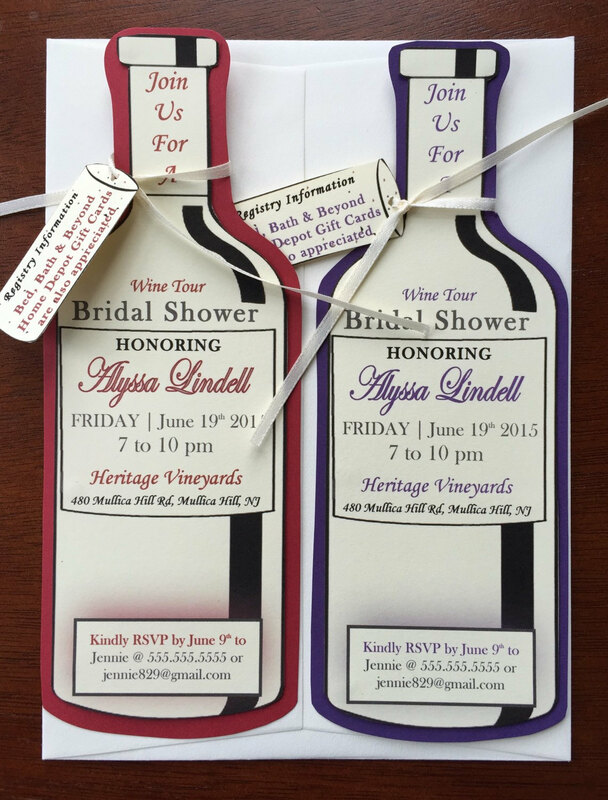 There are lots of wine themed party invitations available online which would work well with these wine tasting party ideas. Check out supplier 1 for designs such as the ones below. 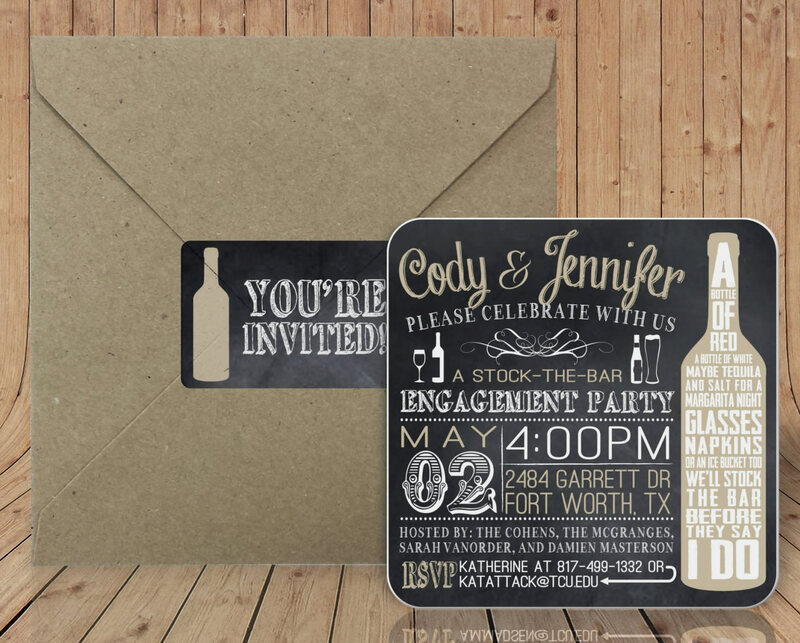 All of these can be customized with different wording depending on the occasion. 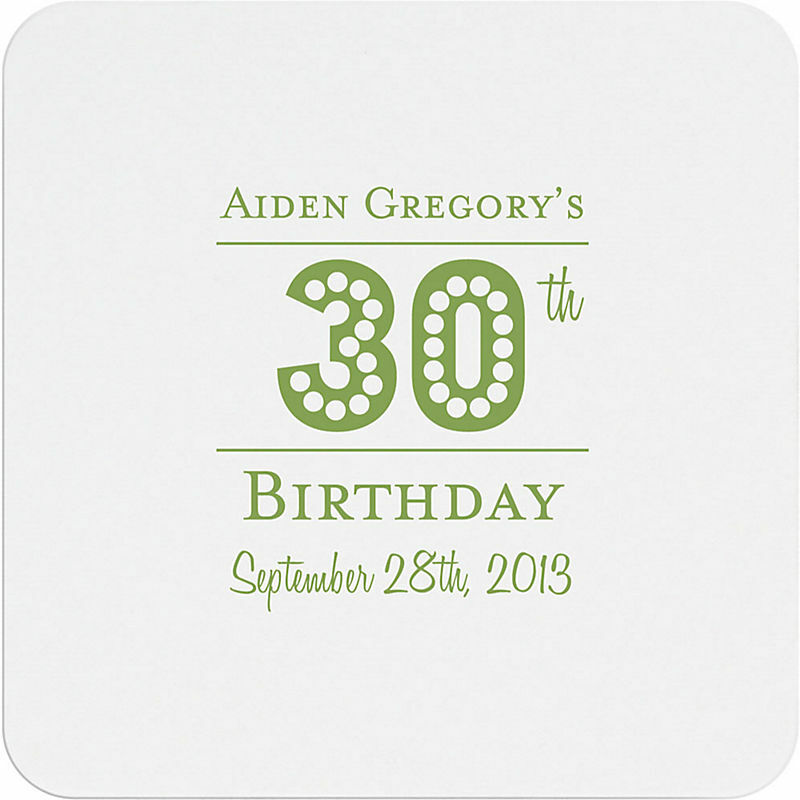 I particularly like these drinks coaster invitations, also from supplier 1 (more designs available) which are definitely more unusual. It's also worth checking out supplier 7, that has a few additional designs that are quite good, such as the ones below. 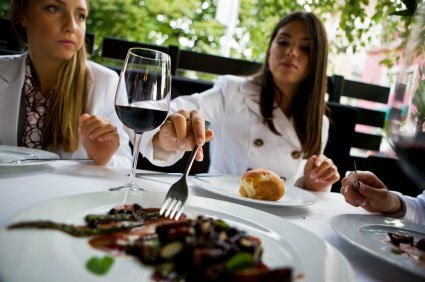 If you're planning a seated dinner to go with these wine tasting party ideas, and you don't want to theme the meal or individual courses to a particular country (as per the Country Themes above) then it's worth doing some research to see what dishes will work best with your chosen wines. Don't get too bogged down in the old fashioned notion of red wine has to go with meat and white wine has to go with fish. Generally it's better to think about matching wines and food based on the intensity of flavor. 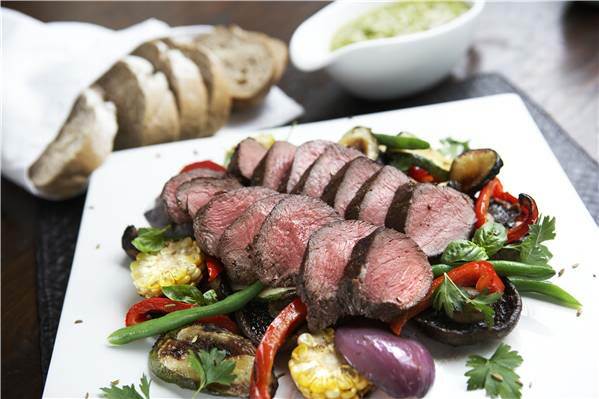 For example, bold full bodied wines such as Shiraz are good with similarly bold foods such as barbecue or Mexican. Similarly delicate flavors such as Chardonnay go well with subtle foods such as Chicken or Pork. Creamy tasting wines such as Viognier or Chardonnay go well with creamy foods such as pasta sauces or cheese. 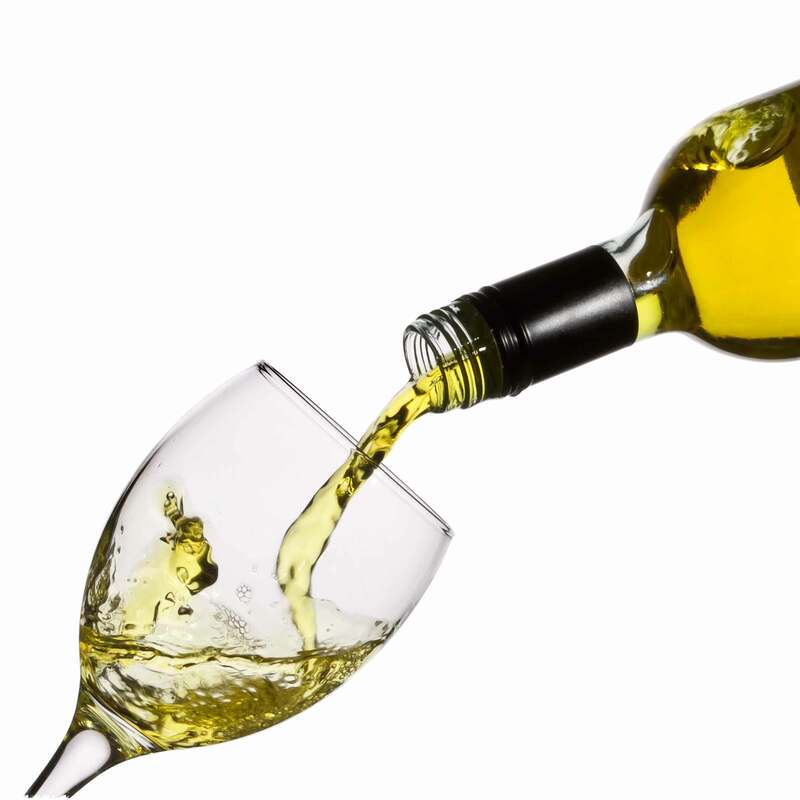 Alternatively, acidic wines such as Sauvignon Blanc also go well with rich, creamy or fried foods as the acid cuts through the fat. If your food has any type of citrus flavors, such as lemon, or is salty then match it with acidic wines such as Sauvignon Blanc or Chardonnay. 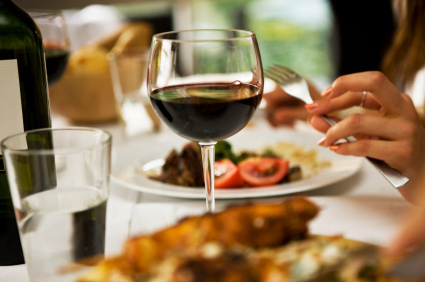 Spicy foods can really overpower most wines and prevent you from really tasting them. 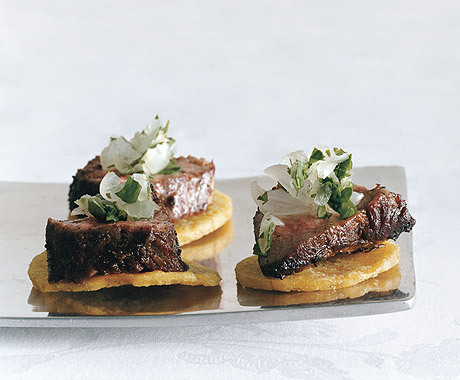 So pair with slightly sweet wines such as Gewurztraminer or Riesling (technically off-dry). The spiciness of the food actually cancels out the sweetness of the wine, making it dryer so you taste it's fruit flavors instead. Match desserts with a dessert wine or Port otherwise. Think about these in terms of color, for example a light, fruit dessert goes well with a Sauternes or Muscat, whereas chocolate is better with Port. Here's a handy table of foods and their complementary wines to help with these wine tasting party ideas. 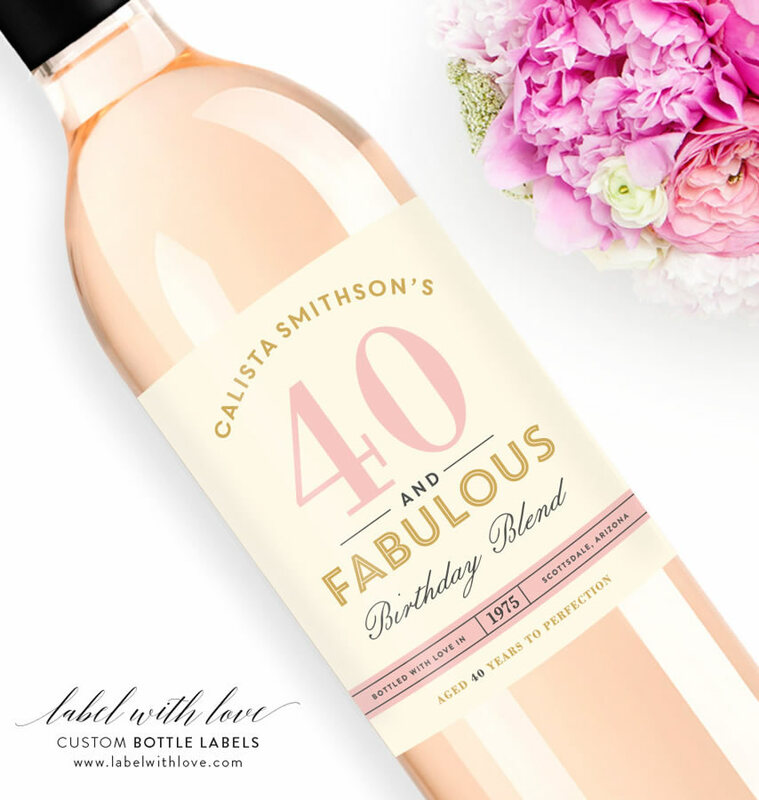 If it's a birthday, bridal shower, or other occaison, a really inexpensive way to make it more special is to use personalized wine labels. Supplier 1 has a great selection for lots of different occaisions. 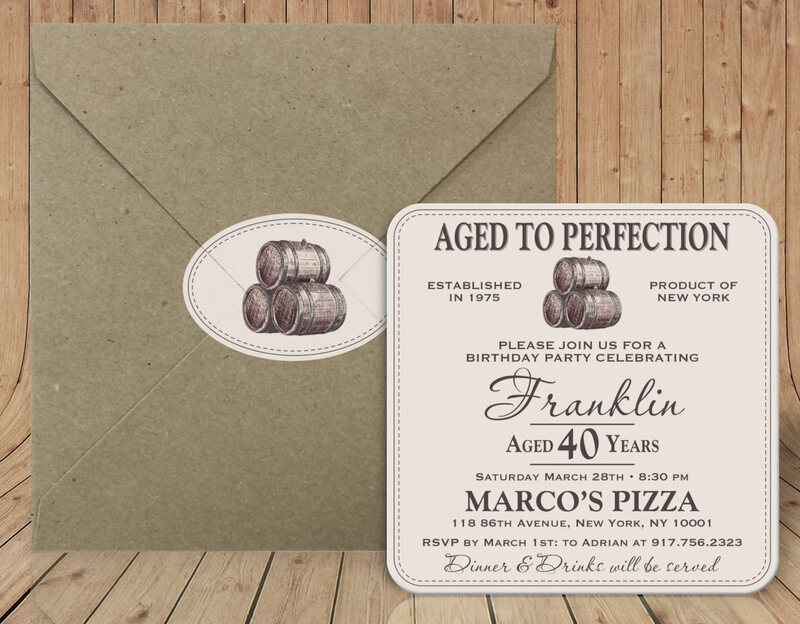 Alternatively, check out Supplier 7 which has a range of labels intended for weddings, but you can change all the text yourself online to use them for whatever occaision you like. 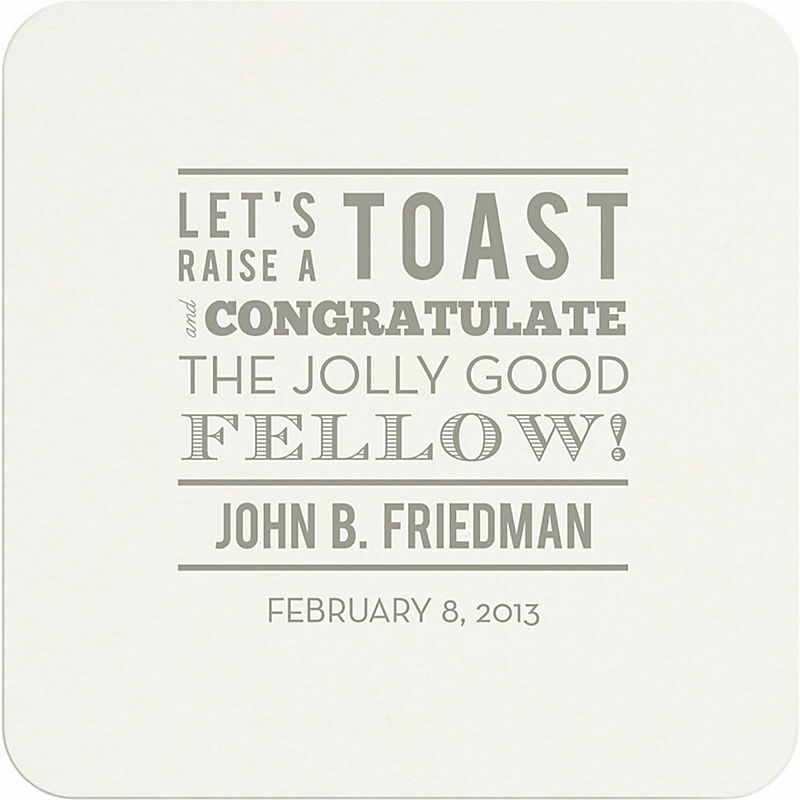 Similarly, Supplier 8 does some nice personalized drinks coasters, such as the one below. 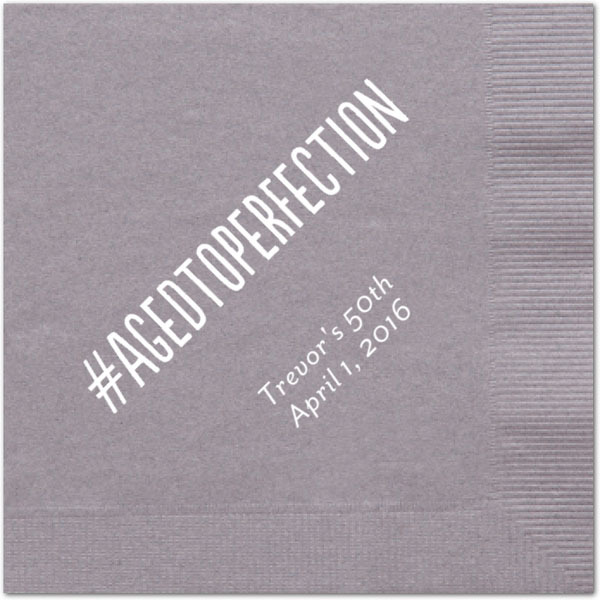 Or check out suppliers 6 and 7 which both have personalized paper napkins which you can customize. I particulary like the 'Fun Facts About the Bride and Groom' one pictured below right. 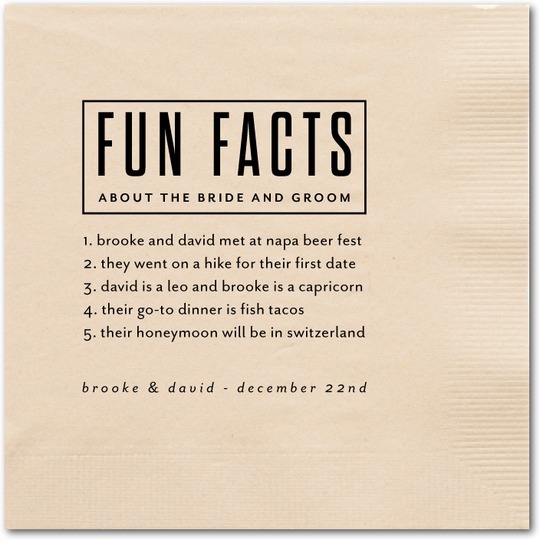 Obviously this is intended for a wedding, but because you can change the text to anything you want, it could be a really nice touch for a milestone birthday, bridal shower, or even for including fun facts about wine. You could even include brief tips for how to taste wine properly on the napkins. This chalkboard table runner from supplier 1 or 5 comes on a roll and can be cut to any length. 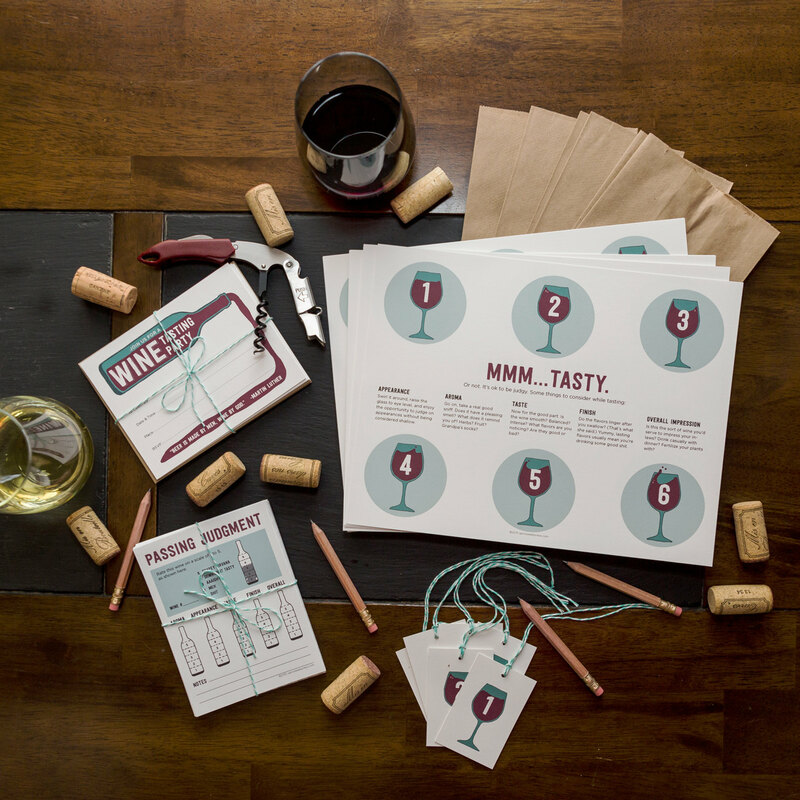 It's a great way to identify different wines and food or give instructions for what pairs best with what. 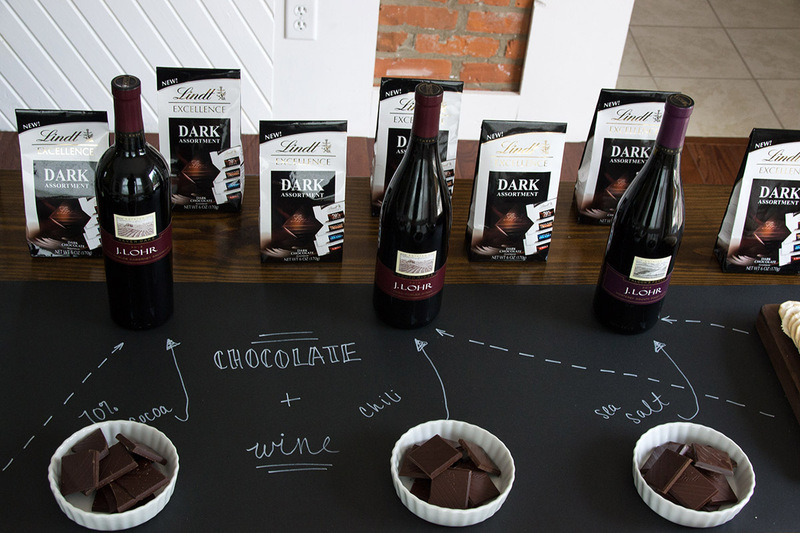 If you're including some wine and chocolate pairings, it's also a great way to show which chocolate pairs best with which wine, as shown in the photo below. Don't forget to check out my other page on wine and chocolate tastings here. 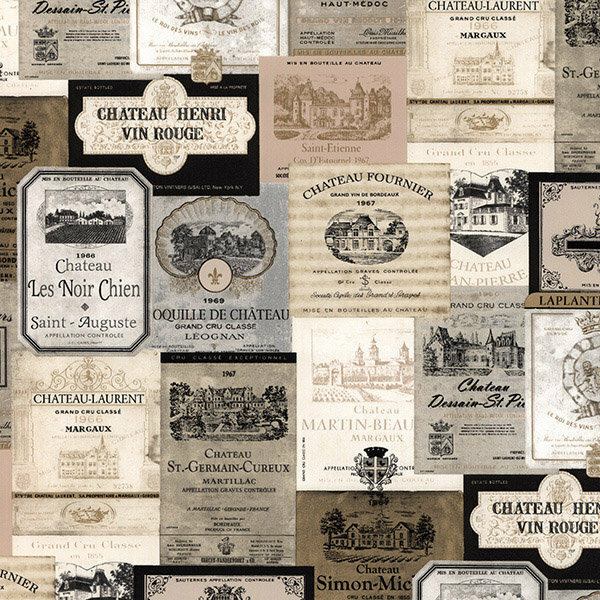 Supplier 1 also has some really nice vintage French wine label wallpaper which is available by the yard and could be used as a decorative table runner or as placemats. For larger numbers, you might want to create a number of different buffet / wine stations around the room to encourage flow. 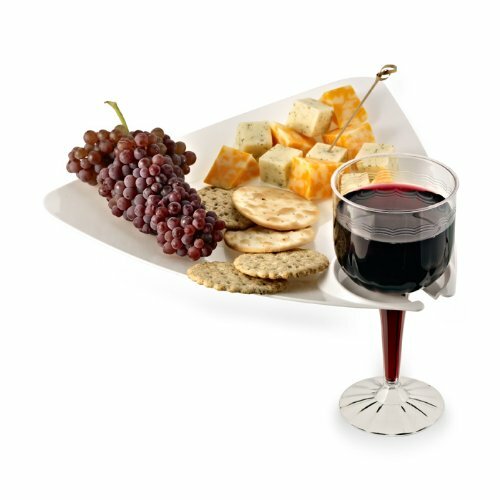 If people are going to be standing, use these buffet plates with wine glass holders so they can keep hold of their wine as they're mingling. 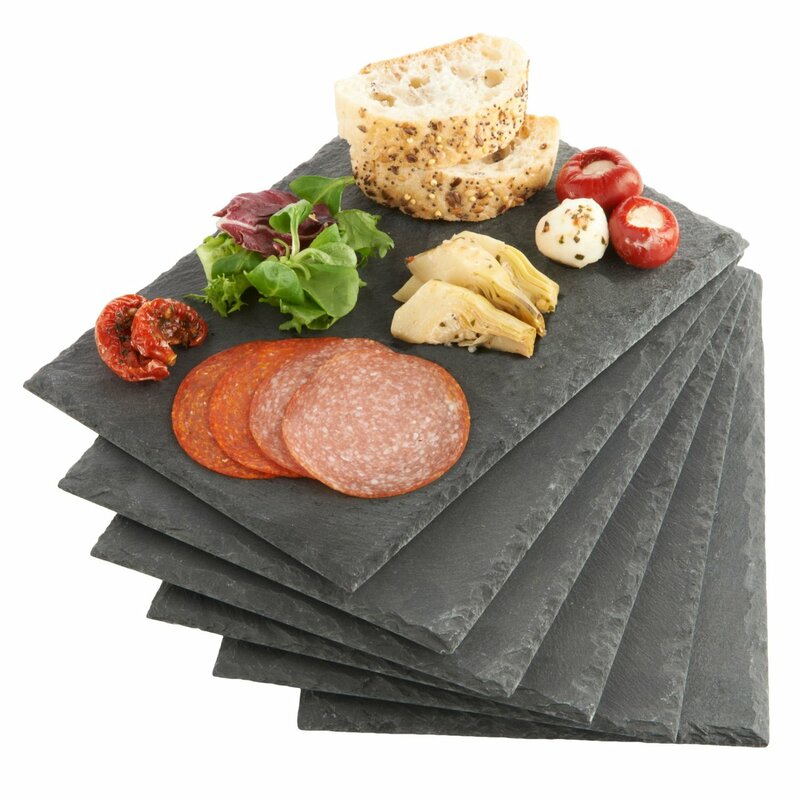 Alternatively, use these chic mini slate cheese boards as plates. Both available from supplier 3. 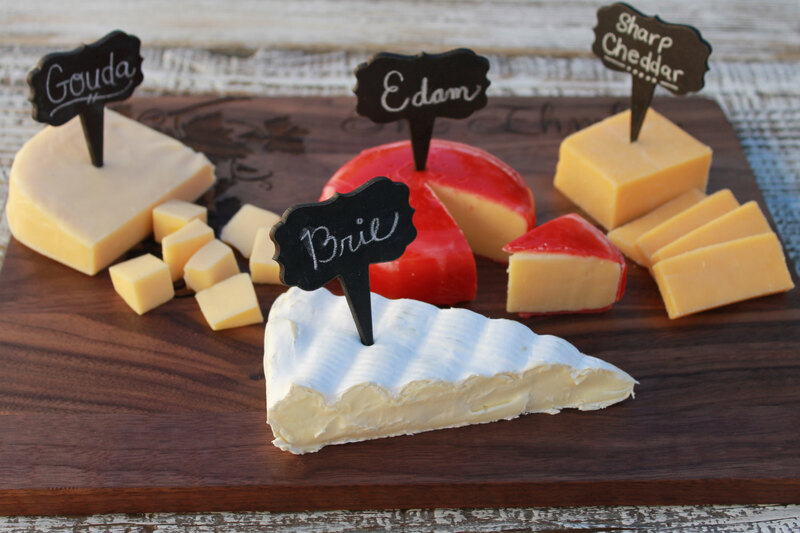 If you are serving cheeses or dips, a nice way to identify these is to use these inexpensive chalkboard cheese labels, from supplier 1 or 3. If you’re applying a country theme to these wine tasting party ideas and you’ve laid out a number of ‘wine stations’ around the room, I would suggest creating some miniature themed table top displays in keeping with each country theme. If you’re sampling Italian wines you might surround your wines with a small display of Tuscan style foods (below left, from Welcome Tuscany) such as artichokes, Italian breads, olives, garlic, tomatoes on the vine, some (uncooked) pasta, Italian salami’s, and some jars of olive oil, balsamic vinegar, and of course grapes. Keep everything quite rustic looking with plenty of brown earthenware / terracotta bowls or wicker / straw baskets etc. 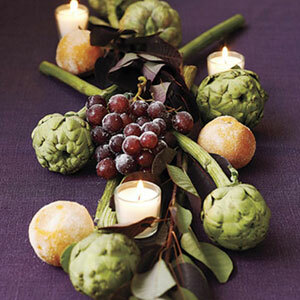 This Organic Table Runner (below right, from Delish) would also fit well with these wine tasting party ideas. 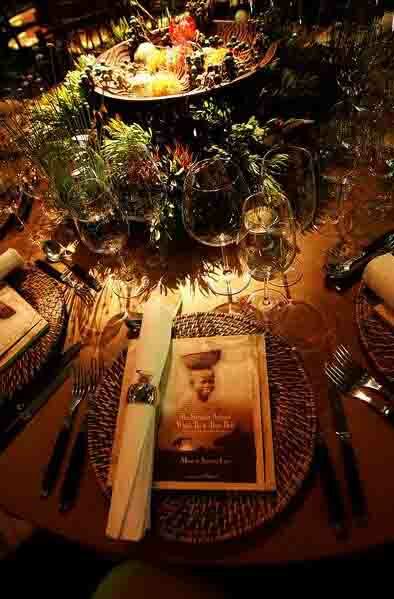 You can take a similar approach to create a South African themed arrangement to display your wines. A word of warning though: a little bit of animal print (ie leopard, zebra etc) goes a long way—so use this sparingly. You don’t want your display to look like it’s been styled a Kardashian. 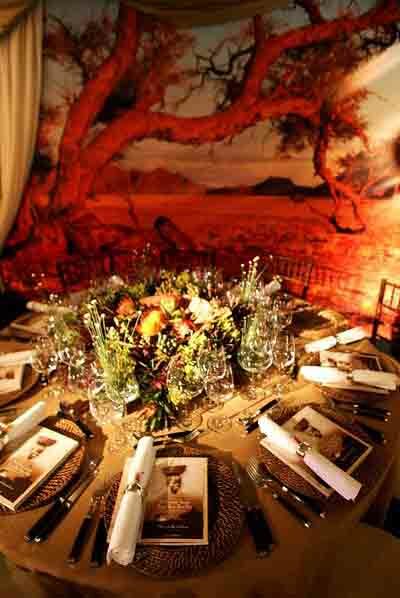 Below is a photo of the tables and centrepieces I used for Elton John’s White Tie & Tiara Ball the year it had an African theme for inspiration (click here to see pictures). 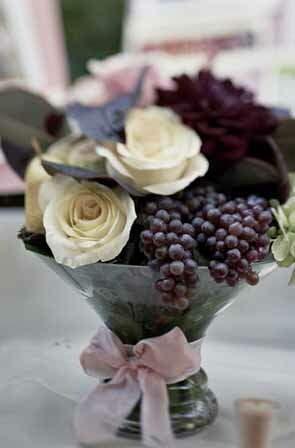 For South African themed wine tasting party ideas I would suggest you use a textured brown table cloth (or just pick up a yard or two of burlap from supplier 3), a large wooden bowl which you could fill with exotic fruits such as mango, guava, papaya, pomegranate, cactus / prickly pears etc (cut some of these open to display the insides in an artistic way), scatter some rustic grasses or banana leaves around, perhaps an old fashion oil lantern or safari hat, any cheap wooden African carvings (ornaments, shields, masks etc), and perhaps one piece of animal print fabric draped (available from supplier 3) around the area. 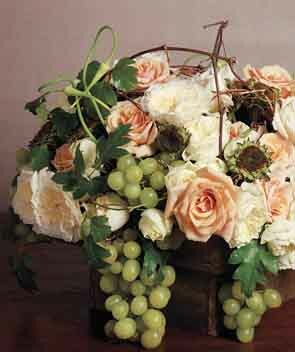 And don’t forget some bunches of grapes. These are just two examples but you can apply the same principle to any of the country themes I’ve suggested for these wine tasting party ideas. You can also apply this approach to smaller seated wine tastings which focus on just one country. Just turn one of these mini displays in a centrepiece for the table. Another idea for decorating a number of different wine stations is to ‘deconstruct’ the flavor profile for each wine. 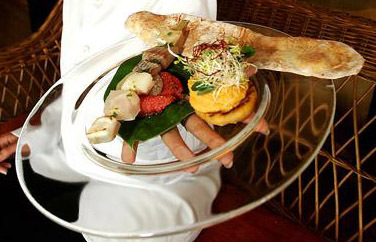 This was a food trend several years ago which involved taking apart elements of a dish traditionally combined together and serving them separately in a unique way. 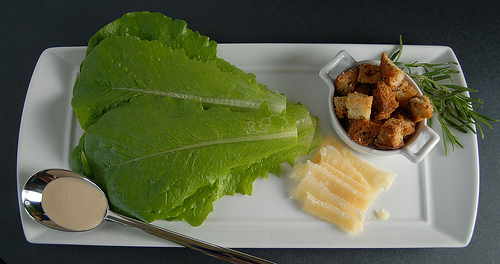 See Deconstructed Ceasar Salad (below left, from Oui Chef) and Deconstructed Black Forest Cake (below right, by Gale Gand via Epicurious, photo by Noel Barnhurst). I think you could apply this idea to wines and create a display around each bottle made up of the components of the flavour profile. For example, A Shiraz might be surrounded by an arrangement of blackberries, blackcherries, licorice, dark chocolate, plums, black pepper, clove, and roasted peppers. Or a Chardonnay might be surrounded by butter, oak, apples, pears, pineapples, and melons. You could arrange these in quite a natural, rustic way or if you prefer a more contemporary, modern style for your wine tasting party ideas you could present each component in rows of identical white bowls arranged in a grid shape. 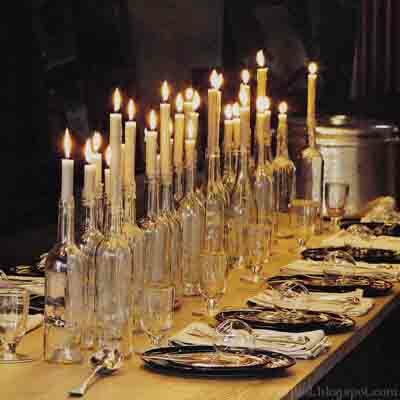 For a seated dinner, you may want to create some wine themed candle arrangements (remember not to use scented candles as these will interfere with the wine tasting). 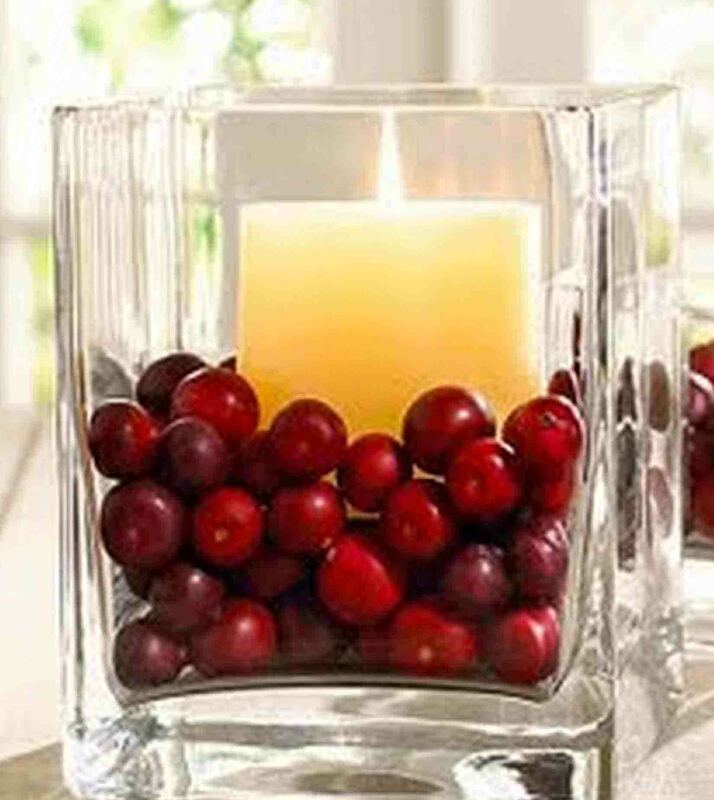 These pictures below (from Grin and Bake It) show a couple of different ways to surround candles with nuts and cranberries. 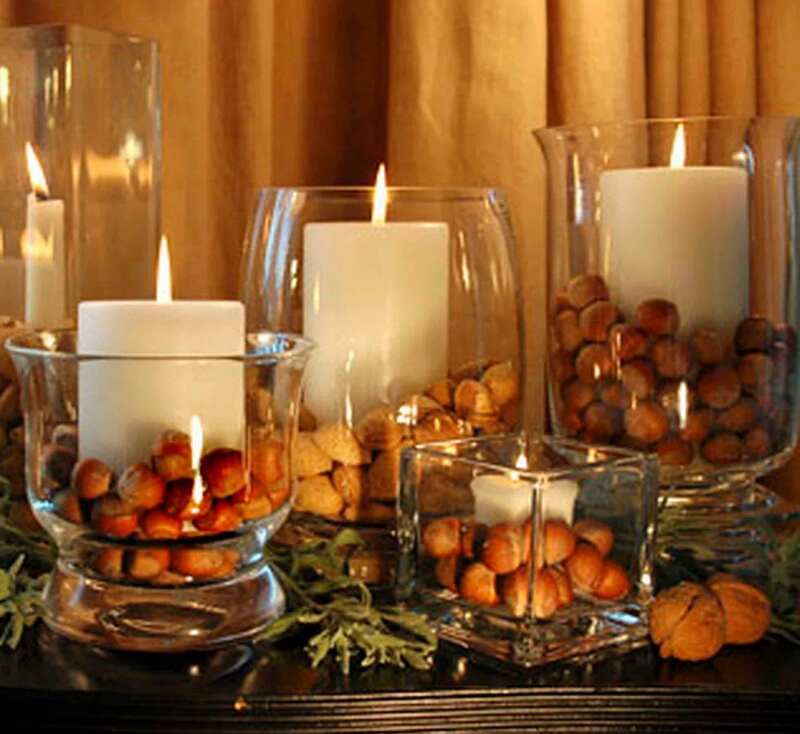 You can adapt these to fit with these wine tasting party ideas by simply swapping the nuts / cranberries for grapes. I would suggest keeping red and white grapes separate though as this makes a stronger visual statement. 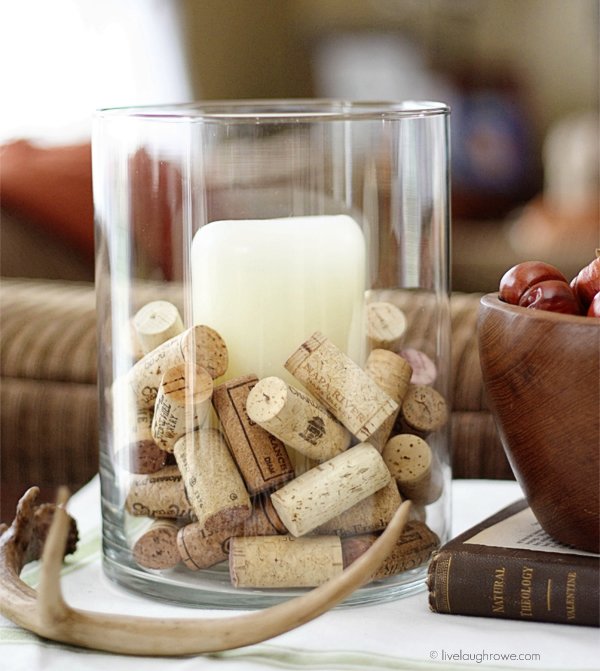 Alternatively, you can pick up bags of 100 corks from supplier 3 for less than $10 to fill vases like these. I was pleasantly surprised when I came across this picture of candles in wine bottles (below by tom mannion via This is Glamarous) as this look can be quite hard to pull off without it looking like a 1970’s French bistro. The reason I think it works is because the bottles are all clear glass and they are arranged en masse. So, if you’re going to include this in your wine tasting party ideas be sure to recreate the look as faithfully as possible. If you use less bottles you may not achieve the same look and it’s a fine line between it looking stylish like the photo, and cheap like a 70’s bistro. If you prefer a more traditional centrepiece using flowers, you can still mix in some grapes to tie it in nicely with the wine tasting party ideas. Just remember that if you are taking the wine tasting seriously, the scent of the flowers may interfere with this). Here are a couple of ideas for inspiration (via Something Turquoise). 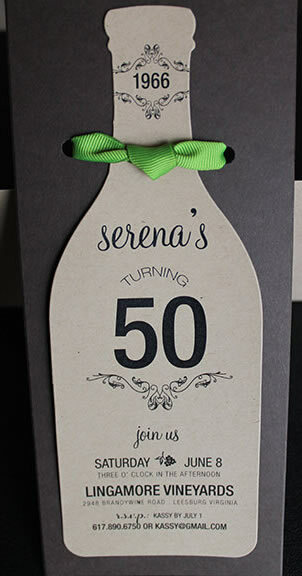 Alternatively, check out the decoration ideas on my Secret Garden party theme page. 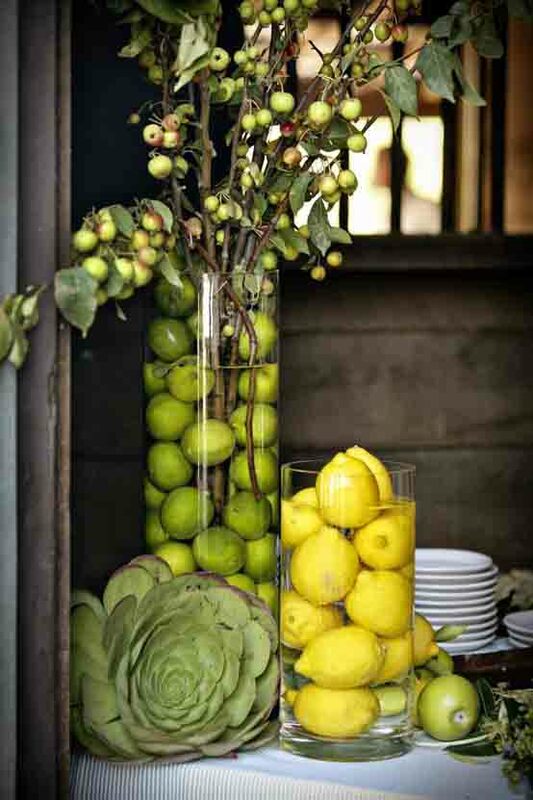 This contains ideas for fruit based centrepieces such as these two below—which could easily be adapted to fit with these wine tasting party ideas by substituting grapes for the lemons / limes. 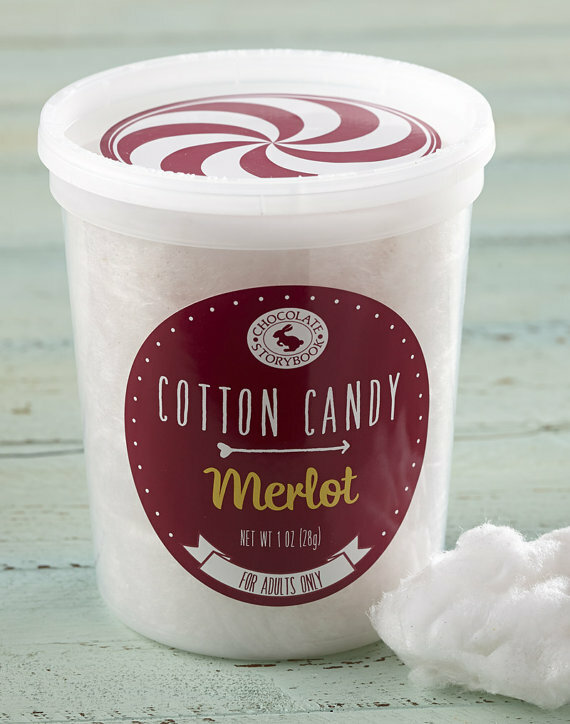 If it's a lighthearted wine tasting, these Chardonnay and Merlot flavored jars of cotton candy from supplier 1 would make fun party favors. 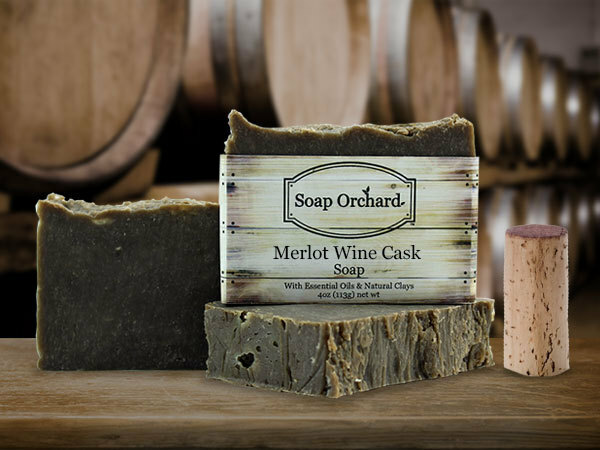 Alternatively, supplier 1 also has lots of other cute wine-themed favors, such as these wine flavored soaps. If one thing is guaranteed, it's that by the end of the evening your guests will be feeling somewhat merry. 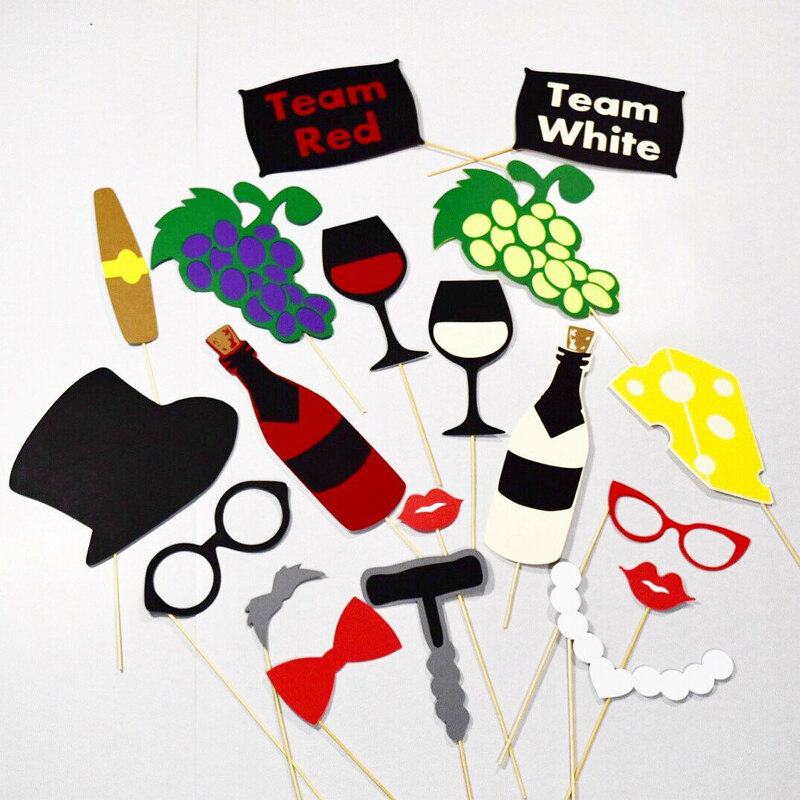 So round off the evening with some group photos using these wine-themed photobooth props from supplier 1. 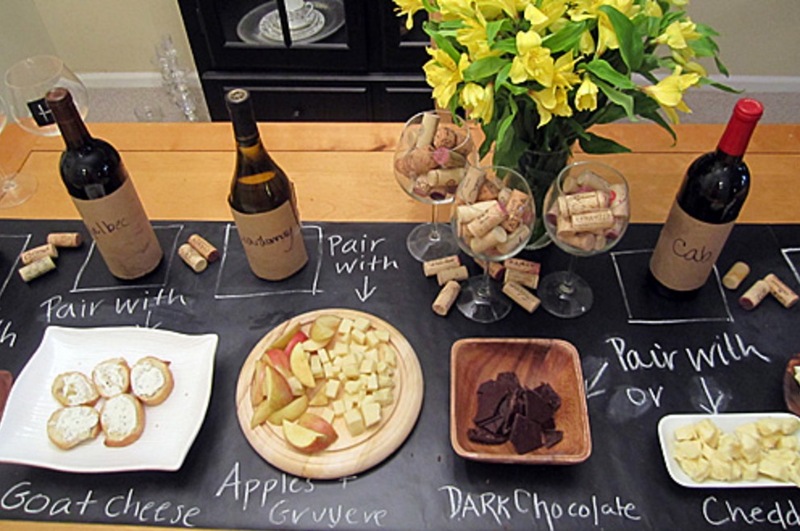 Did you find these Wine Tasting Party Ideas helpful? If you did, please take a moment to click the Facebook, Twitter, and Google +1 buttons below to help me promote this page. Alternatively, if you have your own site / blog, or you contribute to a relevant forum you can use the 'Enjoy this page? 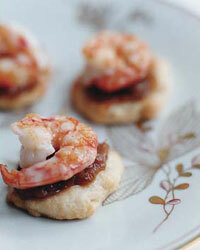 Please pay it forward...' link underneath to link back to these wine tasting party ideas.